To Cite: Kong L, Zhu Y, Zhang Y, Liu H. Benefit of Therapeutic Drug Monitoring of Vancomycin in a Respiratory ICU Patient with Acute Kidney Injury: A Case Report, Iran Red Crescent Med J. Online ahead of Print ; In Press(In Press):e62220. doi: 10.5812/ircmj.62220. Introduction: Vancomycin damage to the kidney is one of the severe adverse reactions. The primary objective of this study was to discuss how the clinical pharmacists should deal with the results of therapeutic drug monitoring (TDM) for Vancomycin. Case Presentation: A case of severe acute kidney injury in a 60-year-old woman receiving Vancomycin as empirical therapy is reported here. The patient was admitted to the respiratory intensive care unit (RICU) of the First Affiliated Hospital of Bengbu Medical College, China, on 15 Oct 2015. On Day 7, the steady-state serum trough concentration and peak concentration of Vancomycin were 102.2 and 111.9 μg/mL, respectively. Clinical pharmacists immediately contacted the clinicians and advised them to discontinue Vancomycin therapy as soon as possible, and the proposal was adopted. On Day 8, serum creatinine (SCr) increased to 719 μmol/L, and creatinine clearance rate (CrCl) decreased to 6 mL/min; then, the patient was given dialysis treatment. 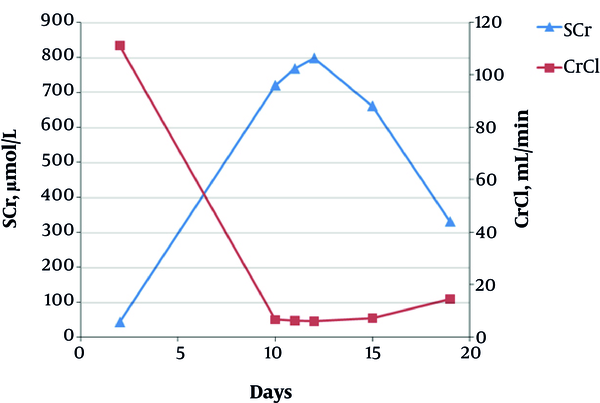 After she underwent dialysis treatment, SCr decreased to 330 μmol/L and CrCl increased to 14 mL/min on Day 19; then, the patient was discharged after she accepted the doctor’s advice to start a home-dialysis program outside the hospital. Conclusions: In this case, clinical pharmacists contacted the doctor to avoid further aggravated renal damage timely when they found a significant increase in Vancomycin concentrations. It indicates that the Vancomycin level can be used as an indirect marker of renal function as increased Vancomycin level results from and contributes to acute kidney injury. Vancomycin, a tricyclic glycopeptide antibiotic was first introduced in 1954 (1). The major prescription of Vancomycin is to treat serious infections, such as infections caused by methicillin-resistant Staphylococcus aureus (MRSA), methicillin-resistant Staphylococcus epidermidis (MRSE), and amoxicillin-resistant enterococci (2). Inevitably, it has some adverse drug reactions, such as local pain, thrombophlebitis, and damage to the kidneys and to the hearing (3, 4). Although the necessity of routine therapeutic drug monitoring (TDM) for Vancomycin has been questioned, peak and trough levels are usually monitored, and studies have shown that TDM significantly increases the rate of clinical efficacy and decreases the rate of nephrotoxicity in patients (5, 6). Previous research has suggested that achieving the area under the concentration-time curve (AUC) to minimum inhibitory concentration (MIC) ratio (AUC/MIC) of ≥ 400 for Vancomycin could offer the opportunity to minimize toxicity and improve the outcomes compared to trough concentration (7, 8). However, AUC-based monitoring would increase monitoring costs because ≥ 2 concentrations are needed. Therefore, it is highly recommended to determine Vancomycin trough concentration as a surrogate marker for efficacy (9). A guideline of the Division of Therapeutic Drug Monitoring, Chinese Pharmacological Society, recommends maintaining Vancomycin trough concentrations of 10 - 15 mg/L for common infections and 10 - 20 mg/L for serious infections (10). A 60-year-old woman was admitted to the First Affiliated Hospital of Bengbu Medical College on 15 Oct 2015. The hospital was an above 2500-bed, tertiary-care, university-affiliated teaching hospital in Bengbu, Anhui, China. The hospital has 39 clinical departments, seven medical technology departments, and 23 teaching and research sections. Her demographic information included a height of 162 cm, a weight of 57.5 kg, a body surface area of 1.63 m2, and systolic and diastolic blood pressure of 134 and 84 mmHg, respectively. The patient noted her chest tightness over five months. Computed tomography of the thorax showed an encapsulated effusion on the right. Therefore, she was admitted to the department of respiratory intensive care unit (RICU). The demographic features and laboratory findings at admission of the patient are shown in Table 1. She was commenced on Vancomycin and Cefodizime as empirical therapy and the Vancomycin dosing regimen was a 1-h infusion of 1 g every 12 h since 18 Oct.
On 22 Oct, the concentrations of Vancomycin were measured by an enzyme-multiplied immunoassay technique, which performed on a Viva-E analyzer (Siemens Healthcare Diagnostics, Lieder Bach, Germany). The steady-state serum trough concentration and peak concentration were 102.2 and 111.9 μg/mL, respectively. Clinical pharmacists immediately contacted the clinicians and advised them to discontinue Vancomycin therapy as soon as possible, and the proposal was adopted. The serum creatinine (SCr) level was detected by the biochemistry analyzer-COBAS 8000 (Roche Diagnostics, Mannheim, Germany) and her estimated creatinine clearance (CrCl) was determined by the Cockcroft-Gault method (11). The patient’s renal function findings (SCr and CrCl) are shown in Figure 1. The patient’s renal function at admission was normal with a SCr concentration of 43 μmol/L and CrCl of 111.16 mL/min. On 24 Oct, SCr increased to 719 μmol/L and CrCl decreased to 6.65 mL/min; after 24 hours, her SCr increased to 767 μmol/L and CrCl decreased to 6.23 mL/min. Then the patient was given prednisolone (30 mg, Qid) and hemodialysis. After undergoing eight dialysis treatment sessions, SCr decreased to 330 μmol/L and CrCl increased to 14.48 mL/min on 1 Nov; then, the patient was discharged from the hospital after she accepted the doctor’s advice to start a home-dialysis program outside the hospital. It is important to note that ICU patients always have dysfunctions in the renal systems (12). On the one hand, ICU patients are uniquely vulnerable to acute kidney injury (13). On the other hand, physiologic changes in ICU patients such as increased cardiac output, and enhanced blood flow to major organs may lead to higher clearance of renal eliminated medications (14). Thus, it is difficult to predict Vancomycin concentrations, and TDM should be performed in these patients. The TDM of Vancomycin not only can indicate whether the bacteriostatic concentration has reached, or it is above the effective concentration limit, but also indirectly shows whether the renal function is normal. As Vancomycin is excreted by the kidney, Vancomycin concentration and renal function interact with each other as both cause and effect in a way. In this case, the clinical pharmacists found a significant increase in the plasma concentration of Vancomycin and realized that the renal function has been damaged; thus, Vancomycin was accumulating in the body. Then, they contacted the doctor to discontinue Vancomycin therapy to avoid further aggravated renal damage timely. In our case, if the TDM was not used, the kidney damage would not be detected in time, leading to further aggravation. Moreover, without the close cooperation of pharmacists and doctors, the patient would fail to benefit from TDM. In conclusion, the main views and innovations of this case were that TDM should be performed when using Vancomycin, especially in ICU patients, and the concentration of Vancomycin can be used as an indirect marker of renal function. In addition, working with patients demands the close cooperation of pharmacists and doctors. Authors’ Contribution: Study concept and design: Lingti Kong; acquisition of data: Yong Zhang and Haitao Liu; analysis and interpretation: Yulin Zhu. 1. Hicks RW, Hernandez J. Perioperative pharmacology: A focus on vancomycin. AORN J. 2011;93(5):593-6. quiz 597-9. doi: 10.1016/j.aorn.2010.09.031. [PubMed: 21530708]. 2. Rubinstein E, Keynan Y. Vancomycin revisited - 60 years later. Front Public Health. 2014;2:217. doi: 10.3389/fpubh.2014.00217. [PubMed: 25401098]. [PubMed Central: PMC4215627]. 3. Kane SP, Hanes SD. Unexplained increases in serum vancomycin concentration in a morbidly obese patient. Intensive Crit Care Nurs. 2017;39:55-8. doi: 10.1016/j.iccn.2016.08.004. [PubMed: 27899248]. 4. Sinha Ray A, Haikal A, Hammoud KA, Yu AS. Vancomycin and the risk of AKI: A systematic review and meta-analysis. Clin J Am Soc Nephrol. 2016;11(12):2132-40. doi: 10.2215/CJN.05920616. [PubMed: 27895134]. [PubMed Central: PMC5142072]. 5. Ye ZK, Tang HL, Zhai SD. Benefits of therapeutic drug monitoring of vancomycin: A systematic review and meta-analysis. PLoS One. 2013;8(10). e77169. doi: 10.1371/journal.pone.0077169. [PubMed: 24204764]. [PubMed Central: PMC3799644]. 6. Bruniera FR, Ferreira FM, Saviolli LR, Bacci MR, Feder D, da Luz Goncalves Pedreira M, et al. The use of vancomycin with its therapeutic and adverse effects: A review. Eur Rev Med Pharmacol Sci. 2015;19(4):694-700. [PubMed: 25753888]. 7. Seabury RW, Stoessel AM, Steele JM. Vancomycin trough concentration poorly characterizes AUC: Is it time to transition to AUC-based vancomycin monitoring? Ann Pharmacother. 2017;51(10):926-7. doi: 10.1177/1060028017716469. [PubMed: 28627271]. 8. Shahrami B, Najmeddin F, Mousavi S, Ahmadi A, Rouini MR, Sadeghi K, et al. Achievement of vancomycin therapeutic goals in critically Ill patients: Early individualization may be beneficial. Crit Care Res Pract. 2016;2016:1245815. doi: 10.1155/2016/1245815. [PubMed: 27073695]. [PubMed Central: PMC4814628]. 9. Alvarez R, Lopez Cortes LE, Molina J, Cisneros JM, Pachon J. Optimizing the clinical use of vancomycin. Antimicrob Agents Chemother. 2016;60(5):2601-9. doi: 10.1128/AAC.03147-14. [PubMed: 26856841]. [PubMed Central: PMC4862470]. 10. Ye ZK, Chen YL, Chen K, Zhang XL, Du GH, He B, et al. Therapeutic drug monitoring of vancomycin: A guideline of the Division of Therapeutic Drug Monitoring, Chinese Pharmacological Society. J Antimicrob Chemother. 2016;71(11):3020-5. doi: 10.1093/jac/dkw254. [PubMed: 27494905]. 11. Cockcroft DW, Gault MH. Prediction of creatinine clearance from serum creatinine. Nephron. 1976;16(1):31-41. doi: 10.1159/000180580. [PubMed: 1244564]. 12. Brochard L, Abroug F, Brenner M, Broccard AF, Danner RL, Ferrer M, et al. An official ATS/ERS/ESICM/SCCM/SRLF statement: Prevention and management of acute renal failure in the ICU patient: An international consensus conference in intensive care medicine. Am J Respir Crit Care Med. 2010;181(10):1128-55. doi: 10.1164/rccm.200711-1664ST. [PubMed: 20460549]. 13. Barletta JF, Mangram AJ, Byrne M, Hollingworth AK, Sucher JF, Ali-Osman FR, et al. The importance of empiric antibiotic dosing in critically ill trauma patients: Are we under-dosing based on augmented renal clearance and inaccurate renal clearance estimates? J Trauma Acute Care Surg. 2016;81(6):1115-21. doi: 10.1097/TA.0000000000001211. [PubMed: 27533906]. 14. Kong L, Tang Y, Zhang X, Lu G, Yu M, Shi Q, et al. Pharmacokinetic/pharmacodynamic analysis of meropenem for the treatment of nosocomial pneumonia in intracerebral hemorrhage patients by Monte Carlo simulation. Ann Pharmacother. 2017;51(11):970-5. doi: 10.1177/1060028017719715. [PubMed: 28677407].